Action from "Once a Jolly Swagman"
Dancer/singer Gene Kelly, in perhaps his only action hero role, fights a neo-Nazi gang in post-WWII Germany. The bad guys capture him and co-star Pier Angeli and take them to a remote snow-bound location where there's an ice-speedway meeting taking place. From the back room of a shed that serves as the pits, Kelly watches the races through a window, and there's quite a bit of race footage. Most of the bikes are converted street machines, but several with skinny front wheels appear to be purpose-built ice-speedway bikes, probably J.A.P.s. The sinister neo-Nazis try to kill Kelly and Angeli by trapping them in a track-side fuel storage area with fuel spilling out on the ground, then staging a race crash that will blow up the fuel. Of course, they jump out of the way just in time, but Angeli is wounded by a Nazi gunman. Amazingly, in spite of a crash, a huge fuel explosion, a fire, and a gunshot woman lying by the track, the referee does not stop the race! Also known as "Daredevils of Earth". Probably the earliest film featuring speedway, but unfortunately does not seem to be available today in any form. Starred a very young Ida Lupino, but more importantly for speedway fans, included Johnny Hoskins, Ginger Lees, and Lionel Van Pragg among the cast. Future superstar director David Lean appeared in a small acting role. This was a film produced in Australia about the sidecars that were included during speedway meetings there. The cast had American actors mostly seen on television shows, most notably Peter Graves. It's been a long time since I've seen this one, but I remember at least one scene of speedway solos sliding around a bend, in which I'm pretty certain one of the riders was Dave Gifford. Documentary sequel to "On Any Sunday" (1971). Speedway was filmed at Costa Mesa and Irwindale speedways in California for "On Any Sunday", but did not make it into the finished film. "On Any Sunday II" featured a speedway chapter with Scott Autrey and Bruce Penhall racing in England, as well as brief shots from Costa Mesa taken in 1971, including Ivan Mauger crashing. Thriller style drama about professional speedway rider, Steve, who is approached by Bobby, a young man interested in the sport. Bobby's rich Uncle Arthur is willing to fund coaching but he is soon murdered. Steve's brother-in-law, Colin, is a Daily Record reporter investigating the case of a missing girl. The two sub-plots intertwine in a story involving terrorism as Steve and Colin attempt to solve the mystery. Some scenes were shot at Blantyre Speedway with Steve Lawson and Bobby Beaton appearing. BAFTA winning sitcom "The Office" features a scene where Gareth and the nerdish IT Guy both claim to have ridden a speedway bike. Follow the conversation on this page. Slovenian movie from 2003 featuring former speedway champ Ludvik, a paunchy, middle-aged widower who makes his living ferrying illegal immigrants across the border into Italy at a charge of 1,000 Euros per head. 1950 movie. Included shots taken at Walthamstow Stadium. The film starred Laurence Harvey (a boxer) and Maxwell Reed (rider of the Wall of Death and Speedway). Depressing ITV soap from the early eighties. One of the characters, Keith Naylor, became mates with a racist speedway rider. The action scenes were filmed at Hyde Road in Manchester. The Speedway Star commented at the time that it wasn't a very good advert for the sport. Early British 'talkie' that featured a speedway sub-plot. John Mills was amongst the cast. Feature film starring three of the girls from All Saints. Described as a 'crime caper', the film is widely considered to be quite atrocious. The speedway connection is limited to some action sequences intended to depict a meeting from the sixties. The action was filmed at Catford dog track and the riders actually race around the greyhound circuit. Check out stills from the movie here. Popular kids show based around a Newcastle youth club. Central character Noddy Fishwick (no relation to Mick) made a one off visit to watch the Diamonds take on Long Eaton. The programme featured some action shots (Mark Thorpe and Richard Hellsen definitely featured) along with the dulcet tones of Barry 'in the box' Wallace (legendary Newcastle announcer since the year dot). Terrible, terrible soap opera that ran for far too many years. Speedway featured briefly in the '60s when a rider checked into the Motel. Action scenes were recorded at Wolverhampton. BBC Childrens drama from the late seventies. Peter Duncan, who later found fame in Blue Peter, starred as Kerry Hutson an aspiring rider. The show was basically a crime caper with a Speedway backdrop. Kerry's father was a former rider and his brother Trevor was a regular for the local Barton Barons. Kerry made his team debut in the last episode. Kerry's Father (Richard) was played by Tony Caunter, now better known as Fat Pat's hubby in Eastenders. Action scenes were recorded at Rye House. The ever popular soap opera featured Speedway in 1997. Local lad Ricky Butcher, the thick one with too much hair, inexplicably became a Speedway rider. The (thin) plot suggested that he'd been secretly practising and, presumably, also secretly spending thousands of pounds on equipment. He was selected to represent the Walford Lions in the upcoming cup final but bottled out in the lead up. On the day of the final he was persuaded to ride, probably by his ginger wife, and turned up at the track (mid-meeting), won a race (from the back of a VERY slow field) and the cup was won. He retired immediately afterwards. Action scenes were recorded at Arena Essex with Troy Pratt 'playing' Ricky. The team manager was Robin Askquith (of 70's 'BritPorn' shame). 'Gritty Northern Drama', as the press like to say, that was extremely popular in its time. One show featured a Belle Vue fan heading off to Kirky Lane. Memories are vague but he wandered around his house in an Aces jacket and we later saw him approaching the stadium. There must have been more to it than that though? This was the programme that made a star of Margi Clark. The classic Speedway movie. Top billing went to Dirk Bogarde as Bill Fox. Fox was an aspiring speedway star who was given a trial by his local side - The Cobras. Fox proved to be an instant success and the story follows him from novice to star rider. There is love interest along the way and eventually Fox marries. He uses his wedding speech to launch a tirade against the wealthy promoters of the day, an action that leads to his premature retirement. The story briefly follows his action in the Second World War and his struggles on demob. Eventually he attempts a comeback, proves the old magic is still there and immediately retires again. It's an excellent film that captures the atmosphere of the sport in the thirties. It's also interesting to watch the presentation of the sport and consider just how little has changed over the years. Other stars of the film are Sid James (playing a promoter), Bill 'Compo' Owen (as Lag Gibbon a veteran Australian rider that loses his nerve) and Thora 'Stairlift' Hird (playing Bogarde's mother! - was that woman ever young?). The film was called 'Maniacs on Wheels' for its American release. Pictures from the film can be seen here. The film is listed in the Internet Movie Database here. American drama series following the adventures of the California Highway Patrol (Motorcycle Police). Bruce Penhall joined the show immediately after winning the 1982 World Final. His debut episode, entitled 'Speedway Fever', incorporated footage of his title win. He played Bruce Nelson, a copper during the day and the World Speedway champion at night. He spent the rest of the episode chasing a gang of bikers through the streets. 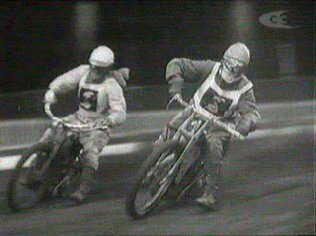 A complete lack of speedway in future episodes led to the programme being axed. Stars Larry Wilcox and Erik Estrada faded to obscurity and Brucie bought himself a boat. Drama 'series' that featured on speedway video fanzine 'Tacky Sub'. Only one (very short) episode was ever made. No idea what it was supposed to be about. Plans for further episodes were binned after complaints about 'language'. Never likely to make it onto UK Gold. "Re "Sidecar Racers" filmed at the Sydney Showground in 1974, it features Bill Landels, John Langfield, Greg Kentwell and Gary Wade. The bikes appeared briefly as the film is dominated by the sidecars. "